If Your A Music Producer Chances Are You Have 808 Massacre Volume 1 or 2 or Even Both & You LOVE Them....Well Now....The Angry Big Brother Of Them All Is Here & Ready To F!#k S@#t Up!! 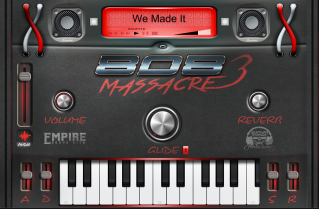 Introducing The All New "808 Massacre 3" Which Is A Fully Functional VST Instrument For Both PC / MAC , 32bit & 64bit Which Should Work In All DAW Softwares Besides Reason Of Course. Containing 50 All New 808 Presets Which Will Have Your Neighbors Calling The Cops (LOL) & At Less Than 30 Bucks THIS THING IS NO JOKE BUT A WEAPON OF DESTRUCTION!! Watch The VIDEO DEMO Below For More Info & Also You Can DOWNLOAD THE FREE DEMO VERSION Usin The "View DEMO" Button Below. This Way You Can Try To Install The DEMO VERSION & Make Sure You Have It Working Before Buying The Full Version.